In ¡Alegría! 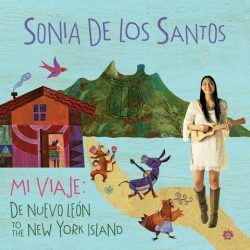 the follow-up to her wonderful album, Mi Viaje: De Nuevo León to the New York Island, Sonia De Los Santos explores the theme of joy and happiness. The term ¡Alegría! literally means joy and in the album’s liner notes De Los Santos brings even more depth to the term by explaining, “In some parts of Latin America it is often used to cheer someone up. We say ¡Alegría! to remind each other that there is something to be happy about. I find this so beautiful.” So do I. Throughout the twelve songs on this album, Sonia reminds us to find the happiness in both the exciting times as well as the quiet moments in the day. Eight of the songs are originals and feature Latin American rhythms like cumbia, curralo and huayno. A whole host of traditional instruments make appearances as well, like the gaita flute from Colombia which features prominently in “Mariposa Montuna,” that celebrates the incredible migration undertaken by monarch butterflies each year and in “Mi Papa Va a Comprar” that mentions the conga, trumpet, accordion, jarana and kalimba. Complex vocals are woven together with fast moving melodies to create gorgeous musical tapestries in songs like, “Calibri Amarillo” and “Los Pajaritos.” De Los Santos strikes a well-chosen balance between the quick moving songs and quieter moments by including tracks like “Amopolita” and the English lullaby, “Daisy Mae” featuring beautiful harmonies performed with Elizabeth Mitchell. Additional songs performed in English include the playful tune “Hey Little Bunny!” featuring Caridad De La Luz aka La Bruja and “Songs for the People,” based on a poem written by African American poet Frances Ellen Watkins in the 1800s, with Dan Zanes and Claudia Eliaza taking lead on the vocals. “Donde Tú Estés, Wherever You Go” is the sole bilingual tune on the album. Originally written in English by children’s folk icons Cathy Fink and Marcy Marxer, De Los Santos has added Spanish translations to the lyrics and the three perform the song together to close out the album. *A 32-page booklet of liner notes is included with the album. De Los Santos includes an introductory note to each song along with complete lyrics, helping to further enrich the experience of ¡Alegría!. Experience a taste of the joy from this album with the video for the title track, “¡Alegría!” below. 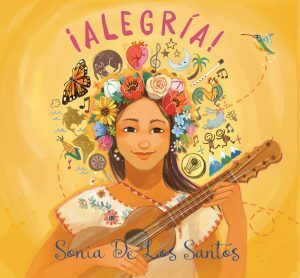 Sonia De Los Santos, who was born and raised in Monterrey, Mexico, does a wonderful job of taking listeners on a tour of Spanish speaking countries in this, her first solo album for families. This collection of twelve songs includes music from Mexico, Spain, the Dominican Republic, Argentina and even a Venezuelan song derived from a Puerto Rican poem. De Los Santos opens the album with the Woody Guthrie classic “This Land is Your Land,” which she skillfully translated into Spanish and performs as “Esta Es Tu Tierra.” Dan Zanes and Friends join her on the original “Tan Feliz” as well as a translated version of Pete Seeger and Lee Hays’s “If I Had a Hammer,” here named “El Martillo.” Also included are songs such as the traditional Mexican rhyme, “Chocolate,” which would be perfect for storytime, “La Golondrinas” a lively original tune about animals that are sometimes referred to as immigrant birds, and a tribute to De Los Santos’s beautiful hometown, “Monterrey.” Sonia De Los Santos is joined by a host of talented musicians from around the world who accompany her on instruments such as the jarana, guitar, violin, maracas and bongos. While all of the songs are sung in Spanish, listeners do not have to speak Spanish to enjoy them. Beautifully illustrated liner notes contain the lyrics as well as a note in English from De Los Santos giving some background to each song. Any of these songs could easily be incorporated into programs or lesson plans about music, dance, families or other cultures. A must have from the newest performer on the children’s Spanish language music scene.